We were fixing up some Hopped Tacos on August 12th at Zappo’s Headquarters! Were you there? If not, you missed out on a hopped-up good time. The drinks were flowing, the tacos were cooking, and the music and weather were perfect. Chef Sterling was turning up the heat with the Beer Belly, served with Beer-Braised Pork Belly, Drunk Pickles, and “magic,” otherwise known as powdered wagyu beef fat (though it definitely tasted like magic); and the Oh Not So Sweet, served with Crispy Sweet Bread, Guanciale (cured pork), and Marmalade. To go along with the well over 3000 bite-sized tacos that were made that day, there were plenty of libations to go around. Breweries like Big Dog’s, CraftHaus, and Joseph James were pouring up their favorite brews in sip-sized cups for all to enjoy. And to balance out all of the tacos and beer, there were some fruity infused waters and kombucha teas. We sure needed them after all of the different flavors we experienced at the Fix booth! Of course, we were there for more than just beer and tacos. Chef Sterling was in attendance along with 11 other chefs to battle head to head in hopes of becoming the ultimate taco champion in one of three categories: Hopped Taco (booze-infused), Taco Dulce, and Taco Loco (the most unique). 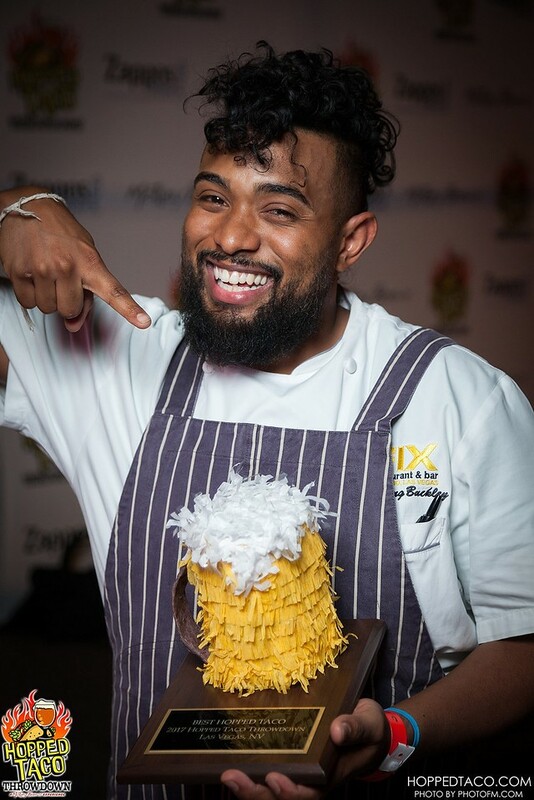 Our very own Chef Sterling walked away as the Hopped Taco Champion for his Beer Belly taco, with Chef Geno from our sister property Herringbone on the stage with him as the Taco Dulce champion. Chef Geno’s winning taco was the Taco Dolce, with Pizelle, Philly Cheesecake, and Oculto & Strawberry granita. And of course, this event wouldn’t have been possible without the amazing team at Motley Brews. Our big thanks go to them for creating a taco and beer party of epic proportions!